Ancient Greece was a time of enlightenment as well as war. They refined the elements of Egypt with the three great architectural orders focusing on the natural balance and symmetry of the human body. Philosophy the beginning of the sciences, advances in mathematics and applied physics allowed the harmonious proportional relationship of each element of buildings to the whole. Lower cost production of iron tools and metal working that rival todays standards along with the classic artistic balance have the carpenters producing quality work that was copied and reproduced through out history. There were Master Carpenters, lower classes of poor freemen capenters called Thetes and some carpenters would have been slaves. Public buildings and many of the important private buildings were now being erected by contract. The homes begin with simple houses and culminates in the monumental temples and the elaborately planned cities. The common people would have rented no more space than a room or two and the apartments typically two story. An interesting development is most followed the same basic open courtyard design copied by the upper class Romans, then in turn in the renaissance by Andrea Palladio, one of the most influential architects in Western architecture. 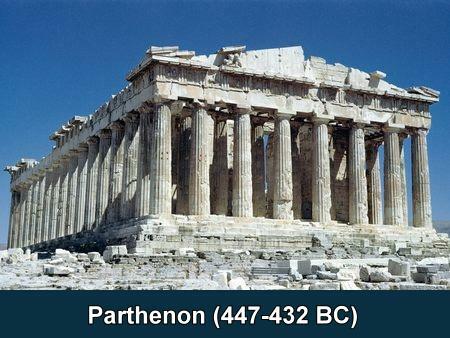 Ancient Greece is considered to be the cradle of Western civilization. The birthplace of Western philosophy, scientific and mathematical principles, literature and democracy (700-30 BC). Hellenic colonies existed throughout the Mediterranean and coast of Asia Minor in Italy, Sicily, France, Spain, Libya, and all around the Black Sea. Alexander expanded the Greek empire from Egypt to modern India and Pakistan (334 BC). A time of City-states and warfare still Greek architecture refined the elements of ancient Egypt with man becoming the focus or “measure of all things” in daily life, art and building design. Carpenters made the earliest temple structures of wood which were later rebuilt in stone known as "petrification". 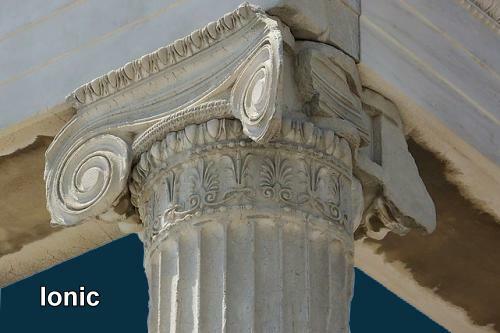 Important to carpentry they codified the three great styles or orders of architecture Doric, Ionic, and Corinthian. 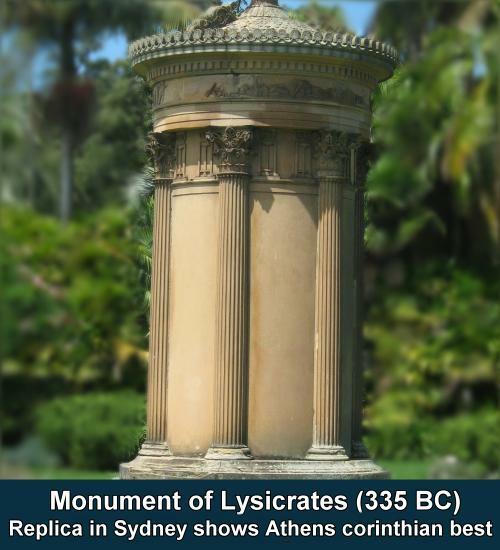 Doric was the earliest order and the one in which the noblest monuments were erected. 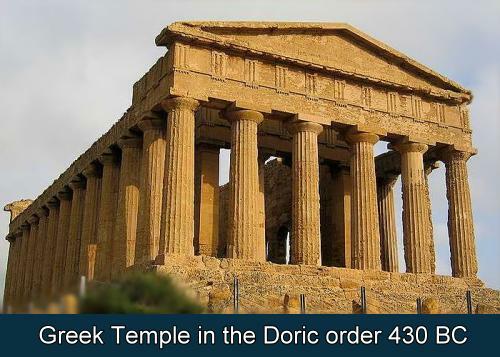 Theories of the origin of the Doric order are numerous. 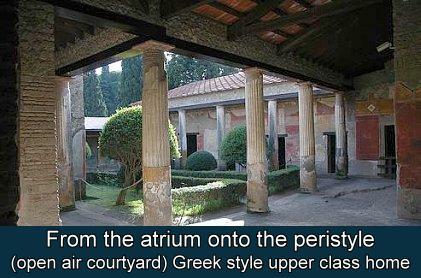 The great remaining examples are found chiefly in Sicily and at Paestum in Italy. 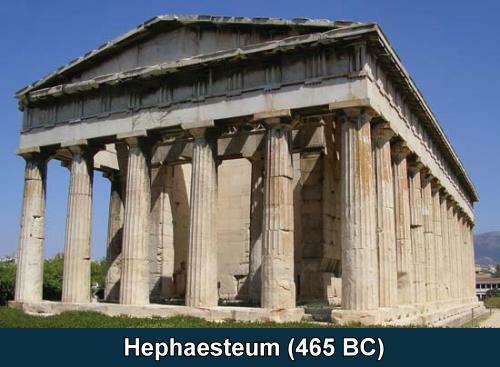 After 500 BC the archaic features of the Doric disappeared; harmonious proportions were achieved; and the final exquisitely adjusted type took form at Athens, in the Hephaesteum (465 BC), the Parthenon (447-432 BC ), and the Propylaea (437-432 BC). The Greek colonies of the Asia Minor coast had evolved their own special order, the Ionic order, stamped with Asian influences. 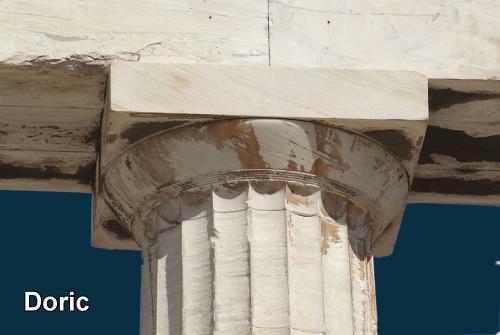 This style appeared in temples in Greece proper after 500 BC, challenging with its slenderly proportioned columns and carved enrichments the supremacy of the simple, sturdy Doric. The most magnificent Ionic temples were those at Miletus. 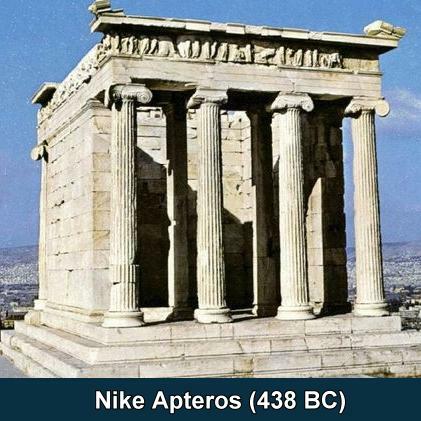 In Greece proper the Ionic appeared in only one temple of major importance, the Erechtheum at Athens, and otherwise the form was restricted to minor buildings, as the temple of Nike Apteros, Athens (438 BC ), and to interiors as in the Propylaea, Athens. The third Greek order, the still more ornate Corinthian order, appeared in this period, reached its fullest development (450 BC) but was comparatively little used. The chief examples, both at Athens, are the choragic monument of Lysicrates (335 BC) and the Tower of the Winds (100-35 BC). 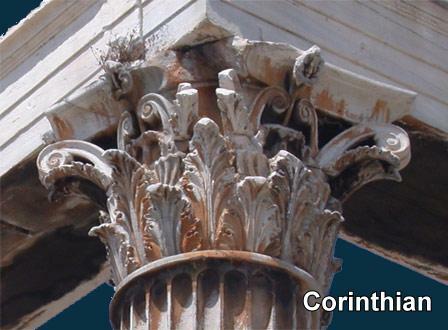 Later, the Romans used the Corinthian order extensively and adapted it into their widely used composite order. 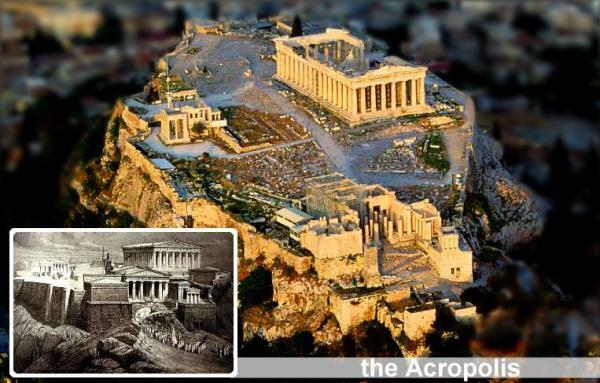 Under Pericles the arhitektons Ictinos and Callicrates supervised the practical work of the construction of the Parthenon (438 BC) in Athens in the Doric order at the Acropolis (upper city) and considered the most perfect production of Grecian architecture. Under public contract the Parthenon and the propylaia alone easily cost more than the equivalent of a billion dollars in contemporary terms, a phenomenal sum for an ancient Greek city-state. Since perfect rectilinear architecture appears curved they ingeniously designed subtle curves and inclines to produce an optical illusion of straight lines. The columns were given a slight bulge in the middle, the corner columns were installed at a slight incline and closer together, even the platform was made slightly convex. These technical refinements overcame the distortions of nature. Parthenon and Athena. 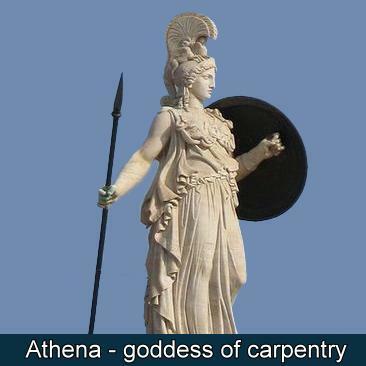 The name means the "temple of the virgin goddess" and refers to Athena, goddess of Wisdom, Warfare, Divine intelligence, Architecture and Crafts the goddess of carpentry. 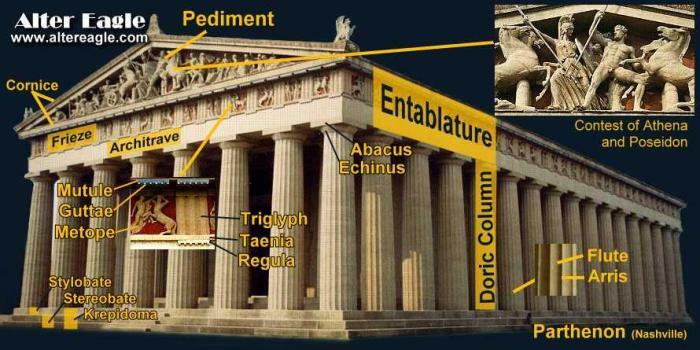 So the Parthenon has close ties to carpenters. Athena presides especially over woodworking. Woodcutters, carpenters, chariot builders and shipbuilders benefit from her attentive protection. She cherishes in particular the carpenter Tekton, son of Harmon, the Adjuster, who knew how to make masterpieces of all sorts and constructed for Paris the ship which brought Helen to Troy. She assists Danaus, the inventor of the first shop with her advice and her aid. According to one tradition, it was she and not Demeter who invented the swing plow and she is seen planing and polishing the wood of Pelias's lance herself. Athena intervenes at all stages of woodworking, beginning with the felling, when Athena directs the construction of the ship of the Argonauts, she herself goes to Mount Pelion to select the trees, which she fells with a hatchet. She teaches the carpenter, Argos, the art of measuring lengths of wood with a ruler and watches over the assembling and adjusting of different pieces with the help of dowels. The harmonious proportional relationship of each element of buildings to the whole was determined through mathematical formulas. The classical and Hellenistic periods produced such greats as Thales considered the "first true mathematician" who introduced logical structure and the idea of proof into mathematics. Euclid of Alexandria (300 BC) the father of geometry his "Elements" are still in use today and the first known written definition of what is now called the golden ratio. Pythagoras, I'm sure you have used the Pythagorean theorem to square building layouts. Hipparchus considered the founder of trigonometry, Archimedes levers and pulleys, the Archimedes screw a device for raising water still used today. Amazingly even analog computers (150 BC) such as the Antikythera mechanism, just to mention a few of their innovations that aided in the advancement of carpentry technology. Arhitekton originally signified a master carpenter. It was attributed not only to ship-builders who were responsible for the construction of the Greek triremes, or to the later "master craftsman" of a temple; but all sorts of craftsmen working with wood. As Greek society developed to be democratic during Classical times they were divided into the three classes nobles, common freemen, and slaves. Nobles did not consider it derogatory to their dignity to acquire skill in the manual arts. For example Odysseus a legendary Greek king of Ithaca himself took rank as a carpenter. 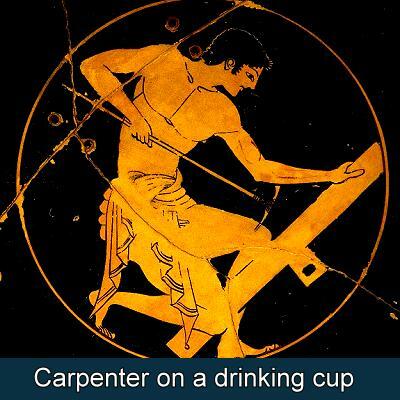 So the hero of Homer's epic poem the Odyssey that describes his 10 year travails as he tries to return home after the Trojan War was actually a carpenter. Carpenters (tekton) could have also been a class of freemen, called Thetes, but with public buildings and many of the important private buildings erected by contract they would as well have been slaves. Even slaves though had classes, the upper class such as police officials and carpenters who may have rented a workshop and made profits with laborers of their own. They could buy their freedom from the master carpenter but freed slaves did not become citizens, instead they mixed into the population of resident foreigners (the metics) and continued to help out their former masters when called upon. Builders in Greek cities on the coast of Turkey, in particular Pergamum, evolve cement (200 BC) in place of weaker mortars. The secret of the new material is the lime which binds sand, water and clay. Development of the terracotta tile roof, the Temple of Poseidon at Isthmia (700 BC). The lever and pulley was invented along with a force pump which eventually evolved into a steam engine. Iron eventually replaced bronze in many uses, above all in the production of tools, lower cost meant more people could afford them, and with iron being harder than bronze the implements kept their sharp edges longer. 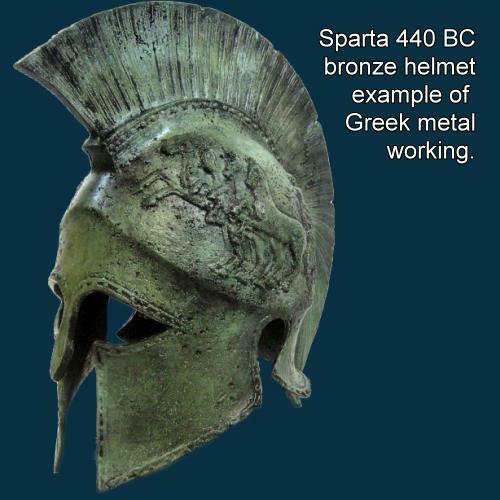 The Greeks, like others in the Near East, turned to iron because they could no longer obtain the tin needed to mix with copper to make bronze. The Archimedes screw, a device for raising water still used today. Extensive plumbing systems for baths and fountains as well as for personal use. The crane and winches (515 BC), further develpment of gears and the spoked wheel. From the collection of poems "Greek Anthology" a translated epigram by Leonidas of Tarentum (300 BC) on an ancient Greek carpenters tools: "These are tools of the carpenter Leontichus, the grooved file, the plane, the rapid devourer of wood, the line and ochre box, the hammer lying next to them that stikes with both ends, the rule stained with ochre, the drillbow and rasp, and this heavy axe with it's handle, the president of the craft; his revolving augers and quick gimlets too, and his double-edged adze - all these on ceasing from his calling he dedicated to Athena who gives grace to work"
In the image of bronze flat axes and chisels. 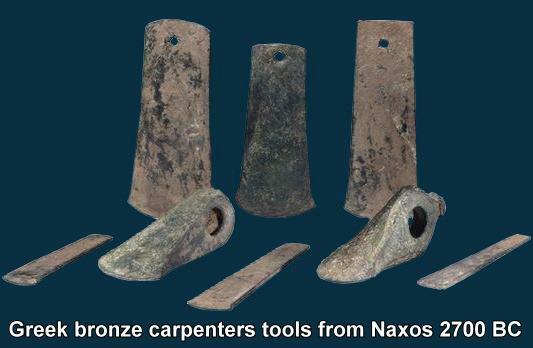 A carpenters tools from the island of Naxos, Aegean Sea, about 2700-2200 BCE. The tools may have belonged to a wandering carpenter or trader who buried them in a time of difficulty and never managed to go back to dig them up. Or they may have been left as a present for a god at a shrine or sanctuary. Either way, they would have been considered very valuable. 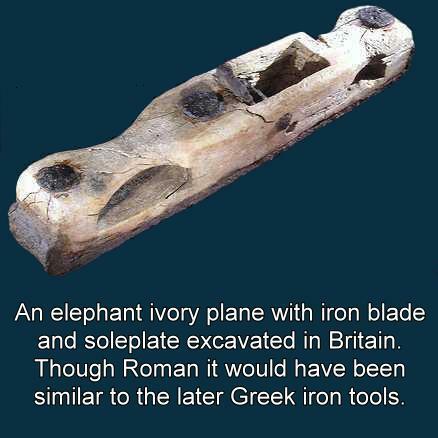 They are from the early Greek bronze age, when metal tools were being widely used for the first time. A side note on the Sea Peoples and the collapse of the Late Bronze Age that brought in the change to carpenters iron tools. The main sources of copper came from Cyprus and tin from Afghanistan so the trades routes were important to carpentry tools. A short re-cap of the most popular theory is that around 1200 BC "sea peoples" sacked the major powers in a World War 0 scenerio. With the new evidence of a 300 year drought in Greece and surrounding area by Kaniewski. I lean more to Eric Cline's theory of how the end was brought about by multiple interconnected failures, ranging from invasion and revolt to earthquakes, drought, and the cutting of international trade routes, a good read for that is his book 1177 BC. That set up the stage for the emergence of classical Greece since it's so important in the evolution of carpenters, at least in my opinion. The homes begin with simple houses and culminates in the monumental temples and the elaborately planned cities. As in any time or place, the raw materials available largely determined the nature of the architecture. 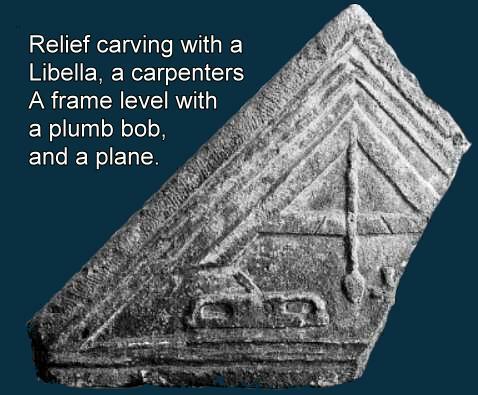 The principal materials carpenters would have used to build private houses were wood, used for support columns and roof beams, unbaked brick used for walls, terracotta (baked clay), used for roof tiles, and tiled floors some quite elaborate. The common people would have rented no more space than a room or two and the apartments only two story. The upper class would have owned their own homes but an interesting development is most followed the same basic design of bedrooms, storerooms, and dining rooms grouped around open-air courtyards, all were generally modest in size. The women and men of the household usually had rooms set apart for their separate use, and included the slaves and renters, but the men were rarely home. Wall paintings or works of art unlike the later Romans were as yet uncommon as decoration in private homes and sparse furnishings and simple furniture were the rule. Water for average household needs had to be fetched from public wells and sanitary facilities usually consisted of a pit dug just outside the front door. The pits were emptied by collectors paid to dump manure outside the city at a distance set by law. They also developed a wooden timber truss similar to a kings truss but only used it on a few temples. An interesting detail I found is the doors on common homes were exactly like those of modern times, except the hinges, they had hinges like ours but didn't use them on their doors. 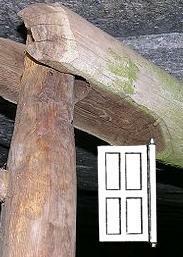 The door-support was a cylinder of hard wood a little longer and larger diameter than the thickness of the door with pivots and holes bored into the threshold the lintel. Then they mortised the door into that cylinder. A later copy was a metal pivot with a bracket.